Enabling a smarter, safer ride. People who Pedal (PwP) gathers and meshes data to enhance the cycling experience for everyone. Users of PwP can contribute by downloading a smartphone app that maps their ride. Aggregate cycling routes and emerging trends will be blended and remixed with open data, GIS, weather and other urban information sources within Urban Opus to provide dynamic location-aware services and support. 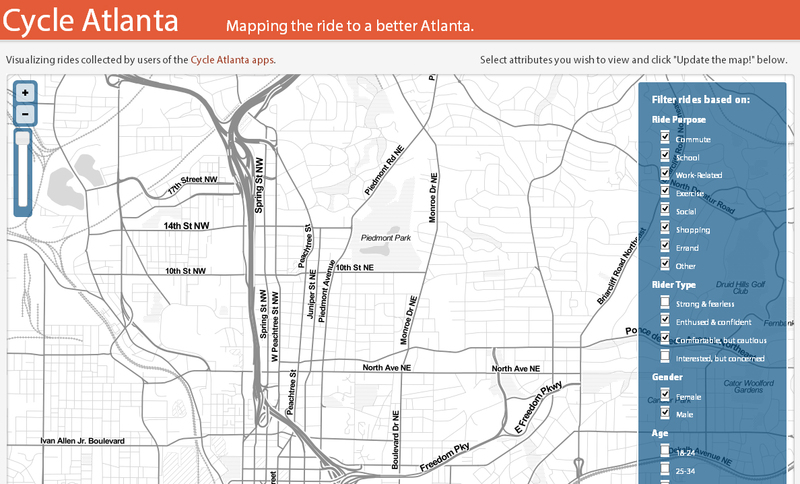 Anonymous open data generated by PwP will help Metro planners and community organizations understand the needs of cyclists. The PwP concept has been proven in other leading urban centers such as Atlanta (map shown below), priming it for a Metro Vancouver adaptation. AUDIENCE: Metro Vancouverites who cycle for commuting, fitness and/or fun. PwP is a definitive Urban Opus project: partnering with an existing community organization to provide distinctive data-driven services and value to their audiences, and Metro Vancouver overall. PwP features the ‘crowd-sourced’ generation of original citizen data which can be combined beneficially with other data sources in the Urban Opus Datahub. The PwP app aims to be the definitive cycling service across Metro Vancouver. Like other applications it will allow users to contribute their rides using smart phone GPS units, but will also incorporate data provided by Open Data catalogues from Vancouver, Richmond, Surrey, etc, including bike rack locations, bike routes, biking-related events and meetups, water fountain locations, and biking-related 311 data to provide cyclists with all of the information they need. Cyclists will be able to contribute new information and reports such as obstacle reports, bike rack locations and other information back to the application database for use by others. Unlike other systems, the data will be contributed anonymously back to the community. This will give city planners, citizens researchers the data they need to understand how different demographics are using their bikes and provide better cycling maps and ride statistics and related information such as bike rack locations, water fountain locations, and ‘unofficial’ bike routes to encourage biking in our region. The application will be promoted year-round, but especially during ‘bike to work weeks’ where city and regional bicyclists will be encouraged to download and use the app to track their biking habits across Metro Vancouver. A web based viewer portal will allow users to access recorded routes and bike patterns of all participants who opt-in for this feature in real time and compare them against your own routes. The system will gather and share insights and tips for your preferred routes from other participants. Only anonymous data will be contributed to Urban Opus and partner organizations such as Metro Vancouver.